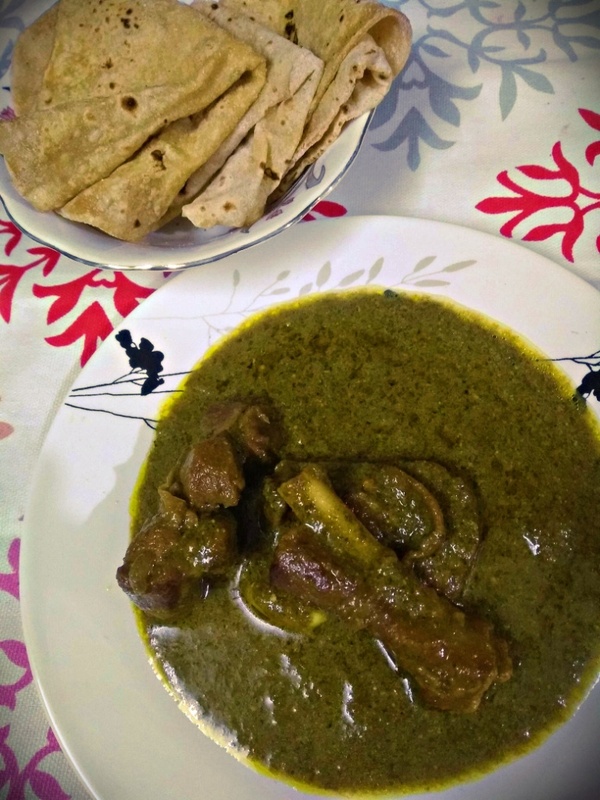 I had contemplated preparing this dish long back but as mutton or male goat’s meat is prepared only during festivals, my family likes to relish only on traditional preparations. The color is fab and the flavors and texture are unique, retaining the aroma of meat. The whole spices enhance the flavors of the spinach gravy. The recipe is not authentic, its entirely mine intuition and the flavors paired up well as I had wanted. Make a paste of onion, ginger and garlic. Boil the spinach and drain water. 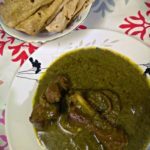 Make a paste of spinach and green chillies. Add the whole spices and red chillies and fry. Saute the onion paste till light brown. Add the mutton pieces and simmer. Cook on slow flame for 1 to 2 hours till the mutton is fall of bones consistency and the fat releases. Take off from the gas oven and keep aside. Fry the spinach paste, till the raw flavors disappear. Add curd and stir constantly in slow fame till it loses all water and forms a thick curry. Add mutton pieces with spices and the gravy and simmer, covered, till the flavors marry. Sprinkle some powdered garam masala. 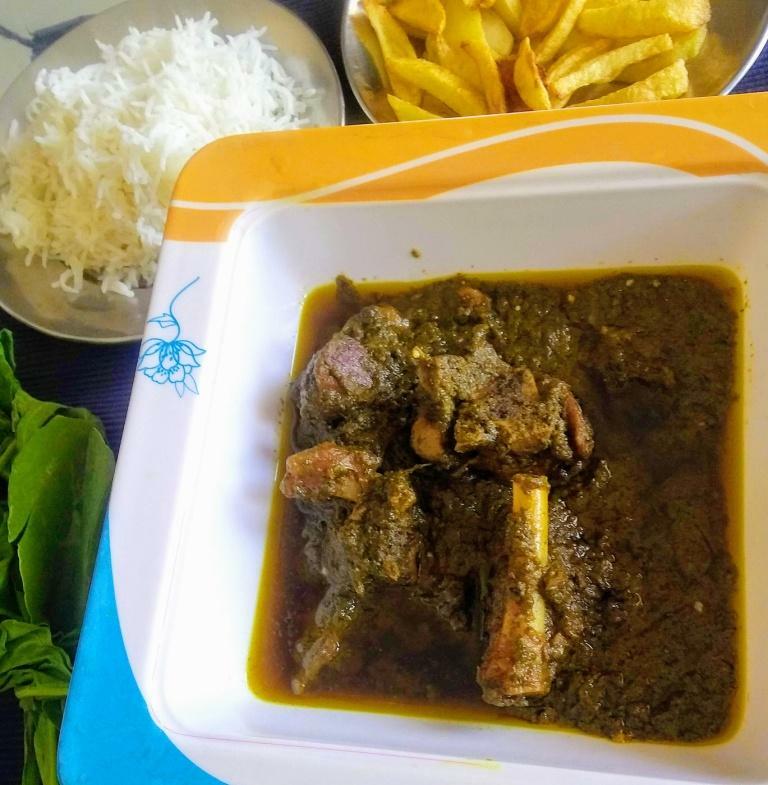 This is an intriguing mutton gravy with the goodness of spinach and flavors from the Indian whole spices. Heat mustard oil in a pan. Add the whole spices and red chillies and fry. Add salt Add the mutton pieces and simmer. Heat clarified butter. Fry the spinach paste, till the raw flavors disappear. Add mutton pieces with spices and the gravy and simmer, covered, till the flavors marry. Sprinkle some powdered garam masala. Serve hot with rice. 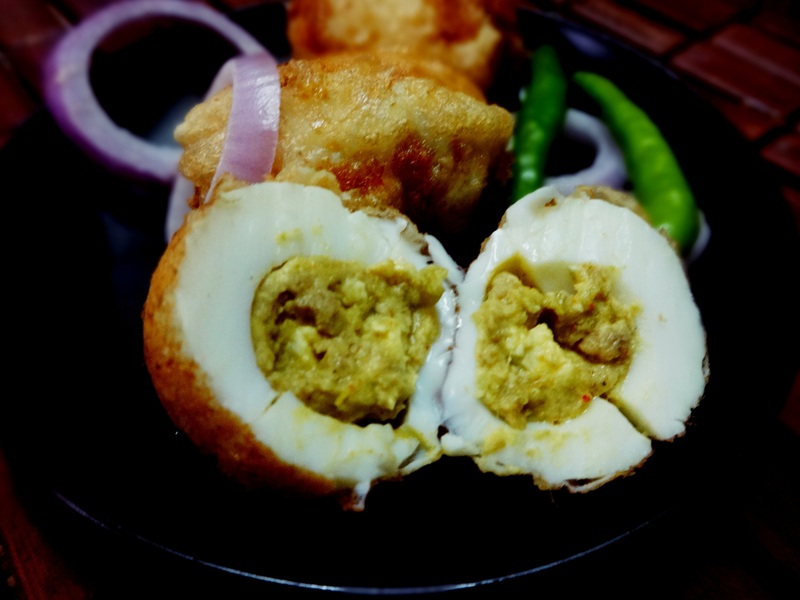 This looks amazing, Indrani. I love the colour, the spinach is fabulous in this.